Everybody starting should have a close look on certain woodworking tools. In the following article I would like to explain some basic tools in more detail. For obvious reasons this is just an overview and some hand tools you should own or might think about buying. Some of these woodworking tools are around for over centuries hand have not changed much. A good set of chisels is key in every set of woodworking tools. I prefer Robert Sorby chisels with an octagonal shaped boxwood handles. After many years of working with a variety of different chisels from Kirsch, Stanley to Bahco - I stick with Sorby's chisels. Steel quality and the excellent fit of the handle in the hand make them my fist choice. The blades edges are honed to a 20° bevel with an leather washer to absorb vibration. The excellent steel quality of Robert Sorby woodworking tools guarantees an enormous blade life time. As far as sizes are concerned your case with woodworking tools should have at least 4 different sizes (I would strongly recommend 6 sizes) ranging from 3/8" up to 1 1/4" of width. A set of squares is another important item in you tools. Look for high accuracy - preferably up to 0.003" or less and please keep in mind that every type of measuring device is the corner stone for your future woodworking project. Spend a little bit more on high precision squares and rulers - because this woodworking tools will stay with you for a very very long time. Make sure that the square is made out of stainless steel and got markings on one side of the rule. As far as size is concerned I recommend at least a square 6" long for your day to day work. 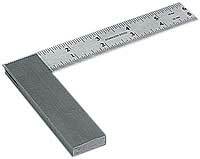 Another shorter square 3" or 4" long could also be handy for your woodworking tools box. When you look for a good square - please check the Nobex Quattro adjustable miter square. I came across one some months ago at a friends workshop and found it very handy. Similar to a traditional square, it can also be locked in different additional angles (45 and 135°). My friend owns the 6" square - but a long - 14" square is also available. As it can be folded together it will not need much space in your woodworking tools box. The ideal tool for your tool box. Out of the hundreds of different tools for woodworking- saws are certainly one of the most important. I will not try to list all the different types of hand saws available - but just explain into more detail my favorite one. Some years ago, when the 'japanese tools wave' started I bought a trim saw. Equipped with different teeth on both sides of the blade it is one of these saws I would never ever want to miss. First used for a house improvement job (trimming doors for a new floor in my house), I stick to this saw for nearly every cuttingtask in my workshop. 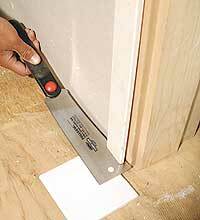 So when you next time at your hardware store nearby, check out Japanese trim saws as the are really wonderful hand tools. Sharpening your tools is for some woodworkers more than just a task - it is more like an art. Depending on the woodworker you ask you will get hundreds of different opinions on what stone to use, what lubricant to use and which way to best sharpen your woodworking tools. For my sharpening I use a Tormek water cooled grinder and a set of diamond stones to finish the blades. The diamond stones are made of a plastic base with a metal sheet on top of it. This metal is covered by crystalline diamond particles. 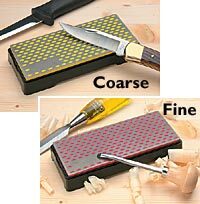 I first bought a diamond stone to sharpen my HSS carving tools, but than discovered that they work very well for my other tools like planer blades and chisels. Whatever you own or buy, keep in mind that tools need some kind of maintenance. Keep them free of dust and clean them up properly after having used them. After all tools are the base of your work. Without them you will never succeed in your projects. This may sound sentimental but woodworking tools mean more to me than just tools. Copying this article to your website is strictly NOT allowed. However, if you like this article, you can use the HTML code below to directly link to this article. Get our free monthly Inside Woodworking Newsletter! With Latest News in Home Improvement, Woodworking, Machinery, and Power Tools.